Inside our body, in a microworld we cannot see, the most important and epic of all wars continues every day, minute after minute, battle after battle. On one side Viruses try to multiply to take control of the cells, on the other side Anticorps try to react and limit the aggressors. Two factions have to control different tissues, by creating groups of connected cells and using some incredible special powers. Who will win the microwar? 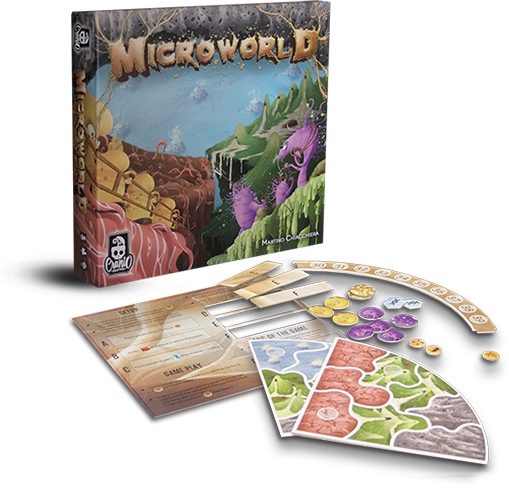 Microworld is a fast strategy game for 2 players. It has simple and immediate rules but it gives a huge game profundity and variability. Furthermore, the game provides the possibility to add 8 special rules to the game that can be combined in a hundred ways; 10 basic scenarios are presented to introduce the starting suggested rules combination!